As it turns out, the footage from Captain Marvel that was shown at CineEurope was more than just a behind-the-scenes featurette. Marvel Studios boss Kevin Feige introduced the clip, which focused on Brie Larson's Carol Danvers and her powers, and also revealed that she will be the "new face of the Marvel Cinematic Universe." On the flipside, the Avengers 4 footage report has been debunked. Instead, it was a clip of Kevin Feige taking about the film along with some behind-the-scenes clips that featured the Russo Brothers talking about the highly anticipated movie. Captain Marvel has already been hyped as the strongest hero in the MCU and now she's being hailed as the new face and leader for Phase 4 and beyond. It was believed that Carol Danvers was going to make her big screen debut in Infinity War, but the Russo Brothers and Marvel later changed their minds and decided to have her introduced in her own standalone movie and then again in Avengers 4. The larger picture of just how important Brie Larson's Captain Marvel is finally starting to take shape. According to Cosmic MCU, the footage at CineEurope highlighted the character's powers and importance. The description reads. "Finally the Captain Marvel presentation did feature footage as opposed to Kevin Feige sitting in a chair the whole time, and it was meant to introduce people to Carol Danvers. The footage shown highlighted her as a character and talked about how she would become the new face and leader of the Marvel Cinematic Universe while talking a little bit about her powers and how powerful of a character she is." 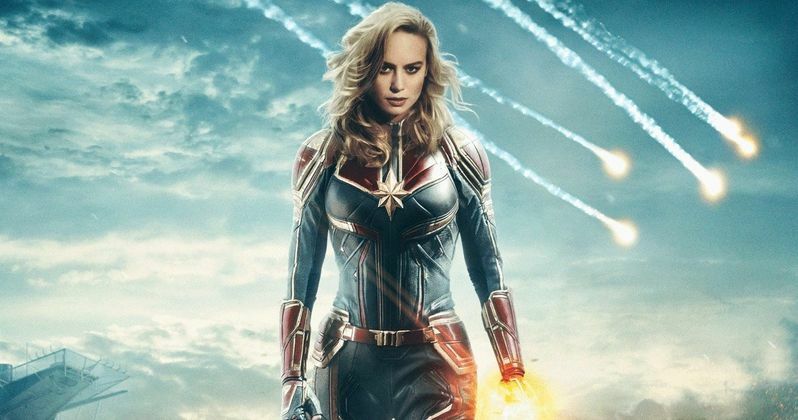 Many believed that a teaser trailer was going to be shown for Captain Marvel at CineEurope, but Marvel Studios decided to go with the featurette route instead, which makes sense. Carol Danvers will be taking on the role of Tony Stark or Steve Rogers for the MCU moving forward, which doesn't look good for those other two dudes. It's been long rumored that both Robert Downey Jr. and Chris Evans will hang up their suits for good after Avengers 4, so the timing of Brie Larson coming on board is no accident. While there's no official confirmation that Tony Stark and Steve Rogers won't make it out of Avengers 4 alive, there have been some pretty interesting theories surrounding multiple time lines, which have been going around for a while, but were given more legitimacy when Ant-Man 2 star Evangeline Lilly compared the upcoming movie to ABC's hit series LOST. It could be possible that Rogers and Stark survive, but end up in a different timeline, one that might not have ever had them as superheroes in the first place. As for Carol Danvers, she will be taking over the MCU after Avengers 4. Screenwriters Stephen McFeely and Christopher Markus have stated that Captain Marvel and Ant-Man 2 will have significant roles in setting up the events of Avengers 4, while also taking part in the action. As to how all of this will work out, that currently isn't clear, but that's just part of the fun. Hopefully some of the Captain Marvel footage makes its way online in the coming weeks, but until then, you can read more about the featurette that was shown at CineEurope over at MCU Cosmic.